Assemblyman Will Barclay will host an American Red Cross blood drive on May 2 at Believer’s Chapel, 614 S. Fourth St., Fulton. “Hospitals are in critical need of blood for emergency rooms throughout our region. Giving blood truly saves lives. In fact, one donation can save up to three lives,” said Barclay. 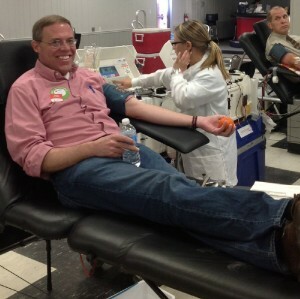 Assemblyman Will Barclay gives blood at last year’s blood drive. Barclay will host another blood drive with the Red Cross on May 2 at Believer’s Chapel, 614 S. Fourth St., from 1 to 5 p.m. Anyone is welcome to donate. It takes about 8-10 minutes to give blood with a total time to register and replenish with provided snacks of about an hour and 15 minutes. Donors are encouraged to eat well and hydrate prior to appointment. There will be door prizes given for those who attend. · Only 38% of the U.S. population is able to donate blood. · Every two seconds, someone in the U.S. needs blood. · More than 44,000 blood donations are needed every day. · The blood type most often requested by hospitals is Type O. · More than 1 million new people are diagnosed with cancer each year. Many of them will need blood, sometimes daily, during their chemotherapy treatment. · A single car accident victim can require as many as 100 pints of blood.